If the idea of scheduling your life—especially your “free time”—makes you feel trapped or overwhelmed, I get it. You want to feel free. You want to enjoy your time to the fullest. I hear you. And yet, scheduling is still the best strategy I know for feeling more free and getting the most from your time. Why? Because we all have a finite amount of energy and decision-making power on any given day. Think of that power like a tank of gas; whether you make mundane decisions like what to have for breakfast or weightier decisions like which new project to take on, you’re drawing on that tank. We only have so much to use before we start running on fumes, something called decision-fatigue. According to researchers, the people who most successfully navigate decision-fatigue do so by conserving their energy for the most important decisions. They develop habits and find tools to help them automate as much of their day-to-day life as they can so they will be freed to use their decision-making energy more wisely. Once you understand how decision-fatigue impacts your choices and the ways you spend your time, you’ll likely be reaching for your calendar. Freedom is choosing how you spend your time, not an actual strategy for navigating your daily life. 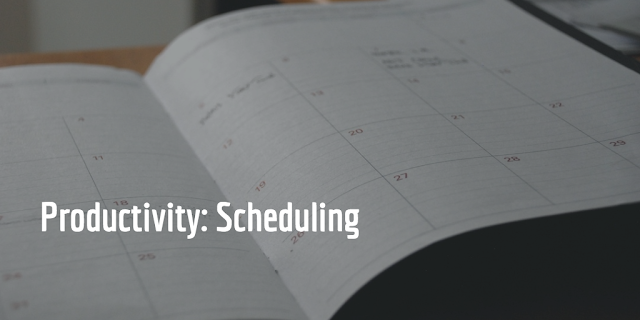 You just need a scheduling strategy that works for you. Here are some of the most common complaints I hear about scheduling and what I recommend you try instead. When you don’t have a system that works for you, it takes precious time and decision-making energy to navigate the consequences of not scheduling your time: digging through paper and emails, misplacing important details, and dropping balls. Instead: Schedule 15-30 minutes a week to plan your schedule, you’ll save time, decision-making power, and stress. If you collect relevant details for each event as you enter it into your schedule, you don’t be scrambling at the last minute. Instead: Make a point of scheduling fun things to do on the weekend, especially in the morning—even better if it involves you getting out of the house. It will get you out of bed, moving, and enjoying yourself, which greatly increases your odds of enjoying that free time. It’s as complicated as you make it. Do what works for you. There’s no one right way to do it. Problems typically occur when we try to force ourselves to use tools that don’t work for us. Just because it works for your friend, doesn’t mean it’s right for you. Instead: Choose a calendar that’s designed to be flexible and easy to use. Something you can instantly update (and sync across devices). I recommend using one you can keep with you wherever you go, say via your smart phone. In the past, it hasn’t been. It’s been tedious and laborious. The good news is that there are technologies and tools available now that make it so much easier. You have options, many of which are enjoyable and surprisingly satisfying to use. Instead: Find a friend or partner who will experiment with you and make a weekly date (over drinks or something else fun). Look for tools that are beautifully designed, customizable, or just enjoyable to look at and use. Make it a game to see who can find the best ways to schedule their life. Your time is yours. It is finite and irreplaceable. Scheduling it is a way to make the most of it and choose the life you want to live. That’s freedom.